Following is a theoretical description of the Knowledge Processes. For practical examples, visit this page. ‘Experiencing the known’ engages learners in reflection upon their own life experiences. It brings into the classroom familiar knowledge and ways of representing the world. An old pedagogical adage says to ‘start where the learner is at’. In literacies learning, experiencing the known does this in a very direct way by asking students to bring to the classroom textual artefacts and communicative practices that demonstrate the available designs in their lives. In this way, learning connects with their cultural backgrounds, identities and interests. Cognitively, experiencing the known involves the explicit articulation of everyday experience which often lies implicit in practices. It prompts self-reflection about the sources of one’s interests and perspectives. By means of these types of activity, not only do learners introduce their invariably diverse experiences into the classroom; teachers and other learners also begin to get a sense of each student’s prior knowledge. ‘Experiencing the new’ involves immersion in new situations, information and ideas. In the case of literacies, this will mostly involve engaging with new texts or texts of an unfamiliar variety—reading written texts, listening to spoken texts or sounds, observing gesture, looking at visual texts or moving about in spaces. In this way, learners are exposed to new meanings, outside of their everyday experiences. However, this will only work as a learning experience if it is within a zone of intelligibility and safety—sufficiently close to their own life experiences to be within what Vygotsky calls their ‘zone of proximal development’. Experiential learning of these kinds has been articulated at length within the tradition we have called ‘authentic pedagogy’, from Rousseau to Dewey and beyond—learning which is relevant to and connected with a learner’s life experience. It is the theoretical basis of immersion models of literacy such as whole language and process writing. Learning is most effective, according to experiential theories of learning, when it is socially situated, when it connects with learner identities and when it is meaningful to them. However, as a stand-alone pedagogy, it has also come under attack and found itself in retreat in recent decades. ‘Conceptualising by naming’ involves classification by the general or common properties. It entails drawing distinctions of similarity and difference, categorising and naming the constituent elements of the thing to which the concept refers. As discussed earlier in this book, Vygotsky traces the development of conceptual thinking through developing the meaning of symbols from ‘complexes’ in the young child to ‘conceptual’ representations in later childhood. However, even for younger children, the symbols they learn to use in school represent proto-concepts, on their way to becoming full concepts through the transformational effects of education. These evolving conceptual understandings can be represented in different modes and multimodally, including for instance, the use of words, diagrams, objects and spaces. Students end up learning school disciplines which consist of specialised, disciplinary knowledge based on more precise conceptual distinctions than those made in everyday language in the course of casual experience. The terms used by academic disciplines are more technical in character and less ambiguous than natural language. The kinds of distinctions they encapsulate are typical of those developed by bodies of academic knowledge (science or history or literary studies for instance) and by expert communities of practice (professionals or enthusiastic hobbyists, for instance). In the case of teaching literacies, using this knowledge process, students develop meta-representations with which to describe the design elements of texts, starting with phonics and picture generalisations in early childhood learning and in later education being able to analyse literary styles or the navigational structures of web texts. Learners are not necessarily given concepts and definitions to apply, as didactic pedagogy often does. Students might also be asked to examine particularities of the experiential world in order to create their own conceptualisations. This is an example of the ‘weaving’ that productively occurs between different knowledge processes. This kind of weaving deepens learners’ cognitive capacities, whether this is conceived as a movement between Vygotsky’s world of everyday or spontaneous knowledge and the world of systematic academic concepts or between the Piaget’s concrete and abstract thinking. ‘Conceptualising with theory’ means making generalisations by putting concepts together into interpretative frameworks. This is how learners build cognitive models or knowledge representations. Experts in a subject domain typically organise knowledge into schemas and make sense of new information through processes of pattern recognition. Such knowledge representations are useful tools for understanding, knowledge making and knowledge communication. Theories can connect concepts in a number of different ways—in a conclusion which makes a generalising statement, in the definition of a term in relation to other terms (as a subset of a parent term, or by distinction with sibling terms), or in a diagram or concept map, for instance. This knowledge process sits within a tradition of didactic pedagogy which focuses on teaching through explicit or direct instruction, starting with generalisations and requiring that students apply them, and teaching that privileges theory as the conceptual essence of a discipline. A conceptual approach to literacies pedagogy involves the introduction of an explicit, abstract, conceptual framework of meta-representations in order to describe the underlying structures of meaning. ‘Analysing functionally’ encompasses processes of reasoning, drawing inferential and deductive conclusions, establishing functional relations such as between cause and effect and analysing logical connections. Learners develop chains of reasoning and explain patterns in knowledge and experience. In the case of literacies learning, students learn to explain the ways in which texts work to convey meaning, the way their design elements function to create a whole, meaningful representation. ‘Analysing critically’ suggests evaluation of the perspectives, interests and motives of those involved in knowledge making, cultural creation or communication. By this means, learners interrogate the interests behind a meaning or an action. This requires interpretation of the social and cultural context of an expression of meaning or a piece of knowledge. Amongst the four traditions of literacy pedagogy we examined in Part B, critical literacy has more of an analytical bent than the others. One key aspect of analysing critically is to reflect metacognitively on the influence of one’s own perspectives and processes of thinking. Thinking is also more efficient and effective when accompanied by the process of metacognition or monitoring and reflecting upon one’s own thinking—an integral part of which is weaving between the new knowledge one encounters in the other knowledge processes and self-reflection about one’s own knowledge background and thinking processes. ‘Applying appropriately’ entails the application of knowledge and understandings in predictable or ‘correct’ ways. To take a literacies example that sits within the pedagogical tradition of functional literacy, a student might write a science report or a narrative in a way that shows they have mastered report or story genre. Applying appropriately involves taking knowledge or text type back to realistic situations of application in the real world or the simulated spaces of education (as if you were a scientist, a short story writer). Such an approach to literacies builds on traditions of literacy teaching and learning which emphasise communicative practice. They draw upon a tradition of applied learning, or learning by doing, in which learning occurs through a process of transfer of generalisable knowledge to practical settings, weaving between the conceptual and the applied. 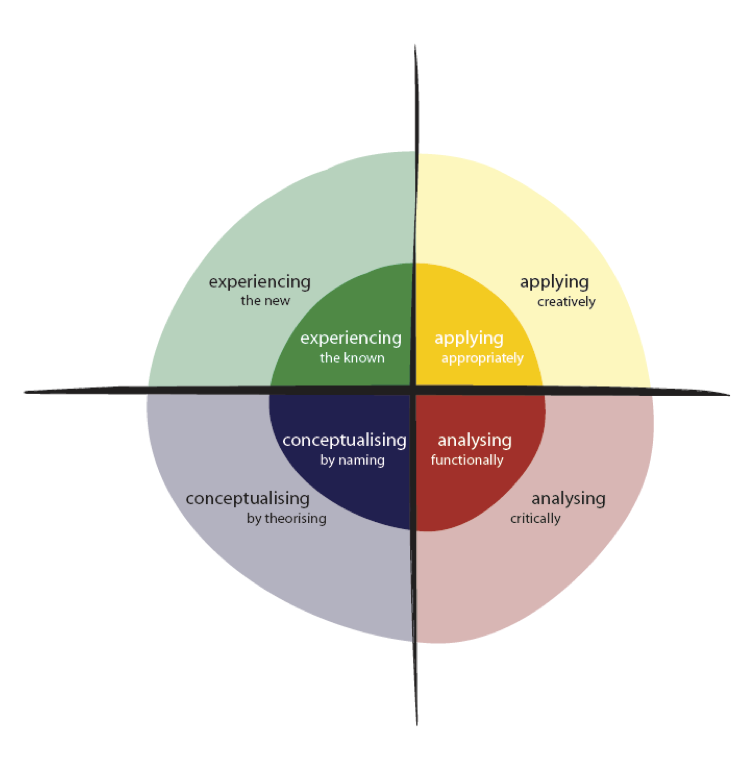 ‘Applying creatively’ suggests a more innovative application of knowledge. For instance, in the terms of functional literacy pedagogy, it might involve recombining design elements to create a hybrid text, or the construction of a multimodal text, or ironical play upon a canonical text type. It may involve the transfer of knowledge or text type from its current or predictable setting to a distant context, subject matter or setting. Or it may bring to bear the learner’s interests, experiences and aspirations in such a way that the application is uniquely or distinctively ‘voiced’. Applying creatively is a process of making the world anew with fresh forms of action and perception. In classroom practice, these knowledge processes can also be translated into purposeful activity types, for instance, those described in Table 12.5 for use in K-12 classrooms. Each of these activities might in fact, be aligned and reframed under other knowledge processes, given particular learning goals—here they are presented as an indicative classification of activity types that can potentially deliver on the knowledge outcome that is the ‘epistemic’ purpose of particular teaching and learning activities. Adapted from: Kalantzis, Mary and Bill Cope. 2010. “The Teacher as Designer: Pedagogy in the New Media Age.” e-Learning and Digital Media 7:200-222. Gee, James Paul. 2004. Situated Language and Learning: A Critique of Traditional Schooling. London: Routledge. Lave, Jean and Etienne Wenger. 1991. Situated Learning: Legitimate Peripheral Participation. Cambridge: Cambridge University Press. Bereiter, Carl. 2002. Education and Mind in the Knowledge Age. Mahwah NJ: Lawrence Erlbaum.